Cells undergoing apoptosis display a number of morphological changes, including chromatin condensation, cytoplasmic shrinkage, membrane blebbing, and the formation of apoptotic bodies (1). 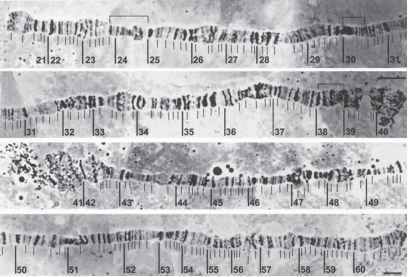 These morphological changes are accompanied by structural changes within the cell, such as the reorganization of actin, nuclear lamin cleavage, fragmentation of DNA, and "flipping" of the phospholipid phosphatidylserine from the interior leaflet of the plasma membrane to the exterior of the cell (2-5). Many of the morphological and structural changes that occur in apoptotic cells are a result of caspase-mediated cleavage of cellular targets (6-8). Caspases are a class of cysteine proteases that function in the immune system and during apoptosis. In mammals, caspase activity is regulated by upstream signaling pathways, which induce either the oligomerization of caspases or the release of cytochrome-c from the mitochondria into the cytosol (7,9,10). Cytoplasmic cytochrome-c then activates the apoptosome, a multiprotein complex including pro-caspases. The genome sequence of Drosophila has revealed fly homologs for most components of the mammalian cell death machinery. In addition, genetic studies have uncovered three novel cell death activators: reaper, hid, and grim (11-13). many tissues by whole-mount RNA in situ hybridization or immunocytochemis-try. In particular, the expression pattern of reaper closely reflects the pattern of cell death during development and can be detected by in situ hybridization or expression of a reaper-lacZ transgene (11,17-23). Antibodies have been described for some of the cell death proteins, including Hid, Thread, cytochrome-c, and nuclear lamins, which are caspase substrates (16,24-28). The antibody CM1, which recognizes mammalian caspases-3 and -7, has also been shown to label dying cells in Drosophila (29,30). The detection of macrophages is correlated with the amount of cell death, and macrophages can be visualized by antibodies such as those against Peroxidasin and Croquemort (15,31-34). In addition to studying cell death in the intact fly, several Drosophila cell lines exist that can be subjected to the same analysis as mammalian cell lines (34,35). Apoptosis can be visualized in Drosophila using a number of standard cell biological techniques, such as staining with propidium iodide or 4',6-diamidino-2-phenylindole (DAPI), which label condensed apoptotic nuclei more intensely than healthy nuclei. Condensed chromatin and other morphological changes of apoptotic cells can also be seen with transmission electron microscopy (15,34,36). In this chapter, we describe three methods specifically used for the detection of apoptosis in a variety of tissues. The TUNEL (terminal deoxy-nucleotidyl transferase-mediated dUTP nick end labeling) technique labels cells with fragmented DNA by the incorporation of labeled nucleotides into 3'OH DNA ends (37). Acridine orange is one of several vital dyes that stain apoptotic cells selectively (15). Annexin V binds tightly to phosphatidylserine, and in unfixed cells, it will only bind to phosphatidylserine that has been flipped to the cell surface (38,39). This property allows Annexin V to function as a specific label for apoptotic cells, and it is often the earliest detectable change in cells undergoing apoptosis.